Scene from Pierre le Rouge at the St. James Theatre. The season of these very attractive performances commenced on Monday, having been postponed from the preceding week, as first announced in the programme. The opening of the French theatrical campaign is, in the dramatic world, what the first primrose is in the natural one--the sign that winter is on the turn, and that preparations are being made to herald in the spring. The migratory birds of fashion collect together again--some from the Continent, others from provincial hibernacula, and others from living through the winter at the backs of their houses, that the blinds might be down, and the shutter-knobs papered in the front, to gain at least the credit of being out of town. Tho occupants of the boxes at the French plays no longer wish their attendance to remain a secret to the world on account of the unfashionable period but swell the lists of the distinguished personages reported as having visited the performances during the week. The opening of the St. James's Theatre is the avant courier of the Opera; and, simultaneously with it, the West-end begins to show signs of returning animation. The house on Monday evening was excellently attended, every box being filled, and the other parts of the house showing few vacant places. Contrary to the usual custom of putting up some insignificant farce, supported by second-rate performers, to "play the audience in," M. Lafont, of the Variétés, and Mdlle. Nathalie both appeared in the first piece--a pleasant vaudeville, entitled, "Le Mari à la Ville et la Femme à la Campagne." 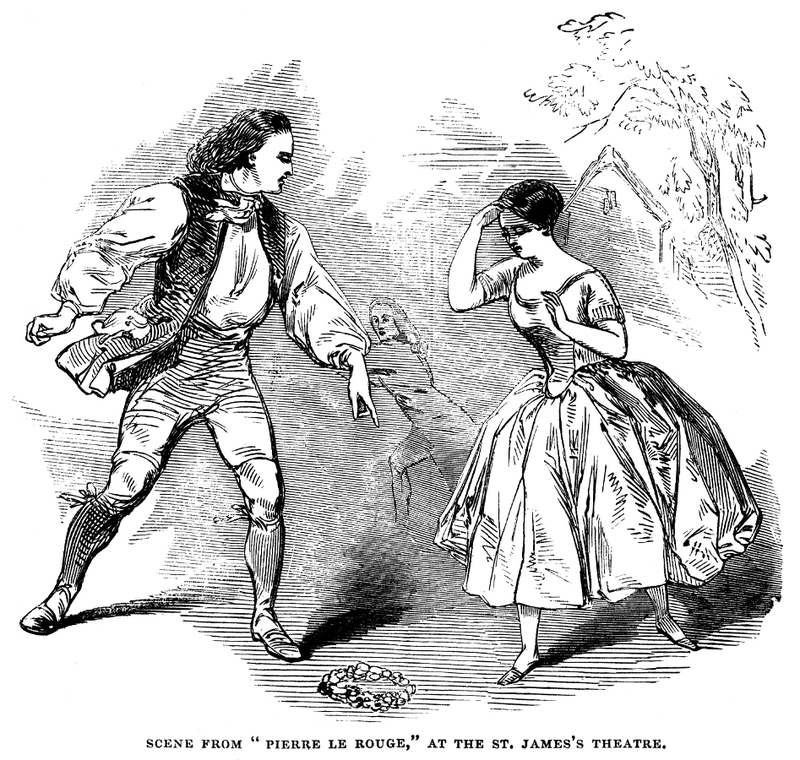 The title of the play may suggest some of the incidents, which were exceedingly light, but sufficiently amusing to keep the audience in great good humour; at the same time, it was admirably played throughout. The drama which followed, called "Pierre le Rouge," is exceedingly interesting, embracing three epochs--before, during, and after the Revolution; and in this the capabilities of the new performers were admirably developed. They at once established themselves as favourites, and were warmly applauded, being called for at the end of the piece. With respect to M. Lafont, however, it was rather a reappearance than a début. Some of our readers may remember to have seen him in the same piece at the Lyceum some years back. Mdlle. Nathalei, as Jeanneton, made a decided impression on the audience. She is a valuable actress. The engraving shows that scene of Pierre le Rouge, in which Pierre tears the unmerited wreath from the head of Jeanneton.